Afternoon visit and welcoming. I treated myself to a bowl of grey peas (pronounced gray pays in here) which were delicious. It was nice to see the real coal fires warming the bars on a cold day. This was supposed to be the starting point for a mini-bus trip to a selection of the finer West Midlands pubs and finishing off at the Dudley Beer Festival. Unfortunately Network Rail had imposed a blanket 50mph speed restriction on the West Coast Main Line because of extremely high winds, a great pity as there did not appear to be anything more than a gentle breeze. Almost two hours late in to Wolverhampton, I had well and truly missed the bus so I decided to have a couple of pints in the Great Western where it just happened that I knew the majority of the customers that were in here, so a couple of pints became a bit of a session. 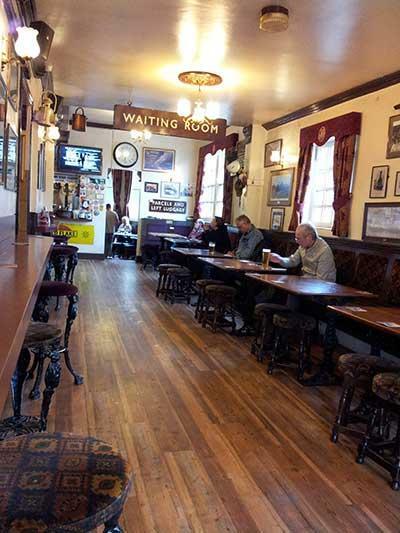 A really superb boozer but not as busy as it used to be when people were allowed to have a beer during their breaks from work. Service was excellent. Sarah Hughes - Dark Ruby 6.00 Fantastic pint. I had planned to visit the Beacon Hotel today, so I took advantage of the fact that this beer was available here. Batham - Best Bitter 4.30 A good traditional black country pint. Good value at £3.20 per pint but a bit of a surprise after paying £2.70 for Holdens, but this is a Holdens pub. Holden's - Black Country Bitter 3.90 A superb pint and only £2.70 per pint. The subway form the railway station is temporarily closed as part of the station rebuilding works so we had to find an alternative route (exit the station and turn left past the new taxi rank). Busy as usual and good service with great beers. Evening's last venue. THE Wolverhampton haven (admittedly after the Wolves football home match had started). Roasted myself by the coal fire whilst musing on today's love's labour's lost (Jeremy Corbyn not part of it) and the cheese and onion baps, in no particular order! My favourite place for missing trains, and I missed at least two of them while I was in here. A good session with a few friends in a good comfortable atmosphere. I purchased a healthy beef with onion and lard cob for the journey home. Holden's - Old Ale 7.20 Truly superb strong old ale. Delicious. 16:00 Last stop before train home. Fairly quiet. As I do every visit I enjoyed a dish of black peas and bacon. Bristol Beer Factory - Independence 4.60 An excellent version of an American Pale Ale. RedWillow - Wreckless 4.80 Disappointing. Bit tired. Camerons - Shotgun Wedding 5.10 Not Tried Pumpclip says Camerons Craft. Chinook, mosaic and El Dorado hops. I arrived at 11:01 expecting to be the first customer of the day, but at least four others had beaten me to it. Holden's - Black Country Mild 3.70 Very good indeed. Not easy to find. It's not far from the back of the bus station but I had to walk through an industrial war zone to get here. Great pub. Very relaxed with lots of folk sitting reading. Evening. If it was good enough for ChrisE yesterday then it is certainly good enough for me. Excellent beer swilling house. Glowing open coal fire soon put roast leg of Pirrip on the menu. Still very much an ale drinkers destination pub, I did not list all the beers that were on sale. We purchased some cheese and onion cobs for consumption on the train home. 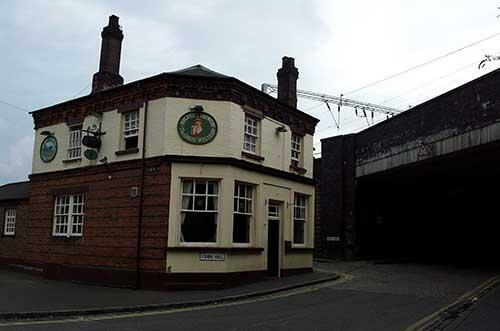 The pub is found in Wolverhampton, West Midlands, WV10 0DG. Located "underneath" Wolverhampton railway station on the corner of Sun Street and Corn Hill. Traditional back street Holden's tied house that has remained unchanged for years apart from a sympathetically designed modern extension, retaining a plethora of railway artefacts. Good value food and guest beers alongside the Holden's range and Batham's Bitter all pulled through 8 handpumps. CAMRA National Pub of the Year 1991. In winter the roaring coal fire can turn you into a human BBQ. We have visited this pub 14 times, seen 27 different beers and tried 13 of them.